5 May 2017 marked the International Day of the Midwife. Recognising the important role that midwives play to families and mothers, the day was first established in 1992. Midwives endure rigorous training to ensure that they can provide quality care for those in need. The level of skills amongst midwives however, can vary across the world. 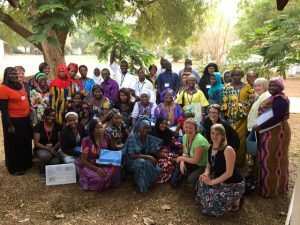 March 2017 saw the arrival of Dr Beverly Donaldson, her midwifery colleagues Maggie Welch and Judith Robbins and paediatrician Dr Anna Battersby from Imperial College London/Imperial NHS Trust to facilitate the third midwifery training programme at the MRC Fajara The Gambia. The aim of the training was to support local midwives in their clinical practice by teaching them the necessary skills to manage basic obstetric emergencies in order to save the lives of mothers and babies in their care. Together, they give their account of the event. “It was a busy few days following our arrival; preparing all the equipment and teaching materials over the weekend in readiness for the start of the intensive two day training programme on the Monday morning. Midwives attended practical emergency skills training in the management of Eclampsia, Postpartum Haemorrhage and blood loss estimation. The first day began with lectures in maternal and neonatal mortality and the management of high risk pregnancy in The Gambia. The afternoon was dedicated to practical emergency skills training in the management of Eclampsia, Postpartum Haemorrhage and blood loss estimation – the major causes of maternal mortality. Running concurrently to the skills stations was a question and answer session in the library which gave participants the opportunity to openly discuss concerns related to maternal and neonatal care. The second day focused on neonatal wellbeing and ‘Helping Babies Breathe’- an evidence-based educational program to teach neonatal resuscitation techniques in resource-limited countries- an initiative of the American Academy of Pediatrics (AAP) in collaboration with the World Health Organization (WHO). 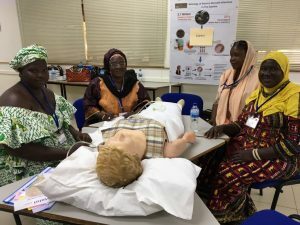 Anna and the team had previously adapted these materials to meet the needs of the Gambian staff and shortened it to make it more accessible to more midwives. We found this to be a simple and effective teaching method which was well received by the lovely midwives in the picture. Following the formal training sessions, we then visited three participating maternity facilities to evaluate the effectiveness of the training by meeting with the lead midwife from each establishment and then assessing their ability to lead the teaching in their own unit. Consequently, we met with very enthusiastic midwives who were very happy to share the knowledge and skills they had been taught. It quickly became evident that the midwives were very good at leading the teaching but they lacked the necessary equipment to continue training at their respective units. After discussion with our training faculty it was decided that we would donate the training mannequins with a view to replacing them before we facilitate the next programme. Overall the training was very successful, was well evaluated and received very positive feedback from the midwives who attended”. I’ve been surfing on-line greater than three hours nowadays, but I by no means found any attention-grabbing article loke yours.